A unique combination of technical cave diving and beautiful underwater photography, way off the tourist track. For me, photography is a way to show others what I’ve seen underwater; how beautiful underwater scenes are, as well as underwater creatures. 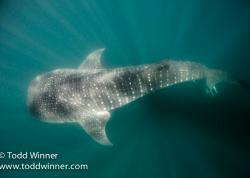 After 12 years of shooting images underwater, I decided that cave photography was my next step to take. 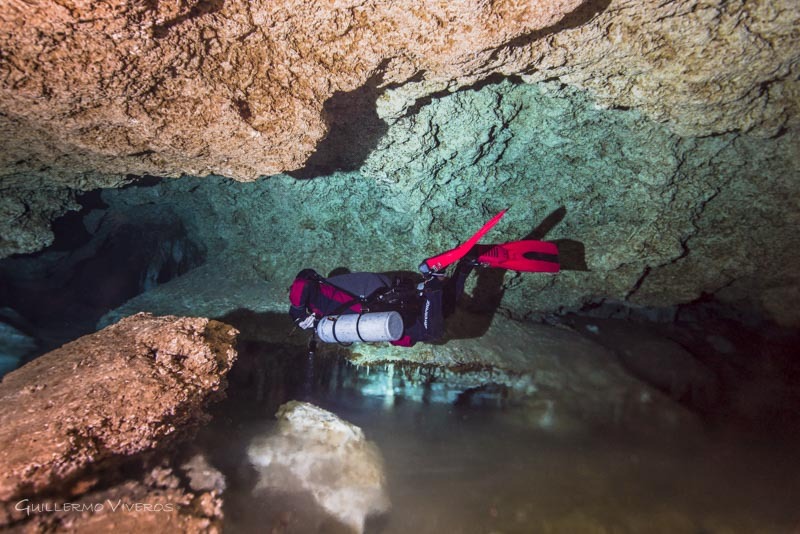 To become a cave diver, you must pass the certification course by mastering several skills - including perfect buoyancy, finding your way out of a cave in zero visibility, following a strict navigation code and being able to dive with 2, 3 or 4 tanks. So, it takes some time, a lot of effort, and many, many practice dives. Diving into full darkness is challenging, and it's necessary to have a good light and 2 or more backups; otherwise you will see nothing at all! 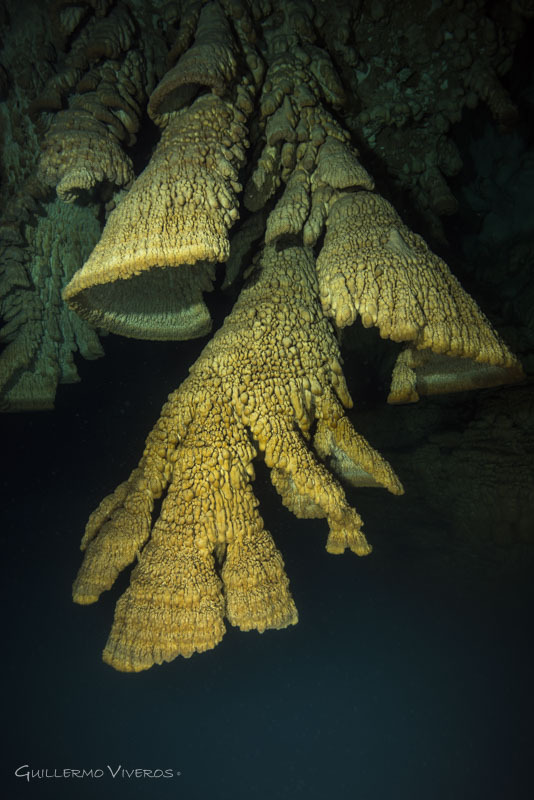 As a cave diver, you get to see very amazing formations that very few people (even other divers) have the chance to see. 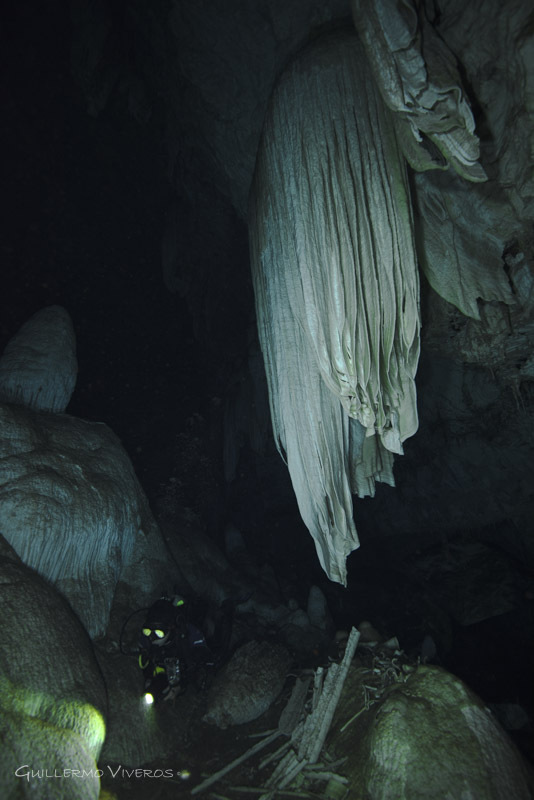 However, carrying a 12kg (26.4 lb) camera/strobe setup and 1.7kg (3.75 lb) light is complicated when diving in cenotes. Going through restrictions, low visibility zones, and diving with 3 tanks with a large camera makes things more complicated than just cave diving. 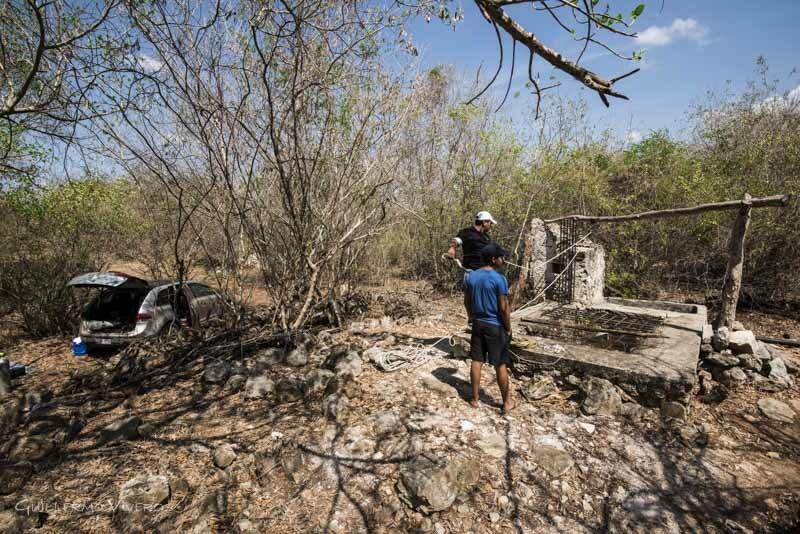 Also, not all cenotes have facilities to make things easy, such as stairs to get into the water, so taking care of your photo gear is a very serious task. Cenotes have a long history back to the Mayans and before. For Mayans, cenotes were sacred places, representing a fresh water source, but also an entrance to the “underworld”. Some of them were used for sacrifices, as well as offerings to the Gods. 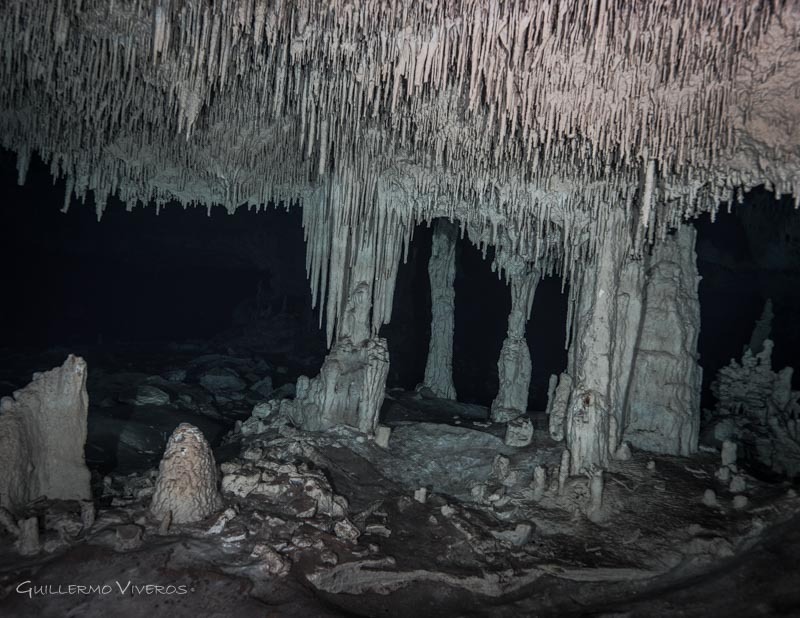 It is important to always keep in mind that when diving in a cenote, you’re not only diving in a fresh water cave, but also in a very ancient cave system that millions of years ago was above water. Additionally, you’re entering into a Mayan sacred place where respect must be shown to the ancestors. And this respect must go beyond the Mayans, towards structures that were created millions of years ago and are very fragile and delicate. In a cenote you must not touch, must not take away, and must not leave anything. Most importantly, a lot of respect must be shown to all the safety factors required for diving in an overhead environment where your level of training must not be exceeded; without the proper training and equipment, your own life may be at risk. Some cenotes may not have nice facilities such as an access road, parking area, or tables or benches to assemble your gear. But when you go underwater, it worth it. Such is the case of D’Zonot Ila Cenote. Here you need to use ropes and pulleys to take all your diving and photo gear down about 12m (40’) through a small opening to the water, and gear-up on the water. 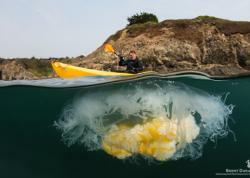 However, when you see what’s beneath the surface, it’s hard to believe. Some other cenotes are even less inviting. 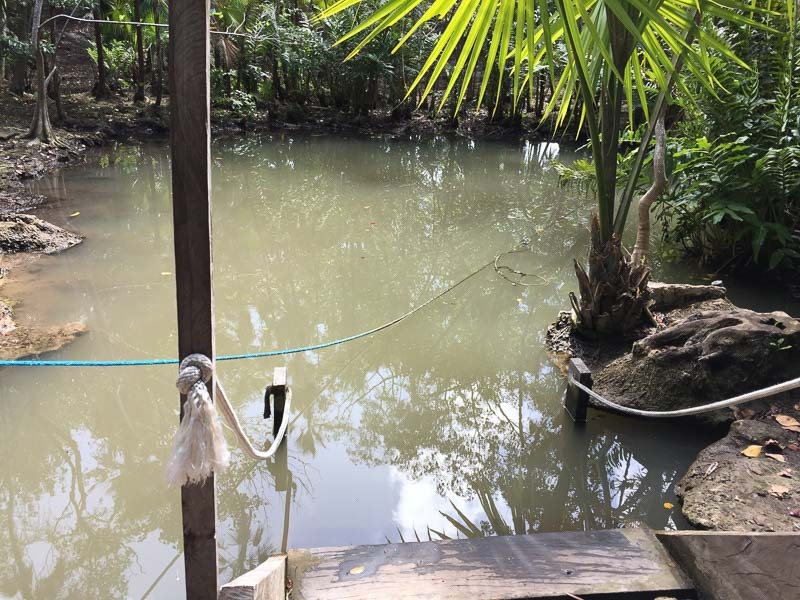 They make you not want to go in the water at all, because all you can see from the surface is a small pond of murky water. When entering the water, visibility is almost zero and you must rely on a line attached to a tree next to the pond. Even worse, you have to follow the line down for about 2 minutes before the visibility gets better. But once you do, the water clears up so much that you feel like you’re flying! 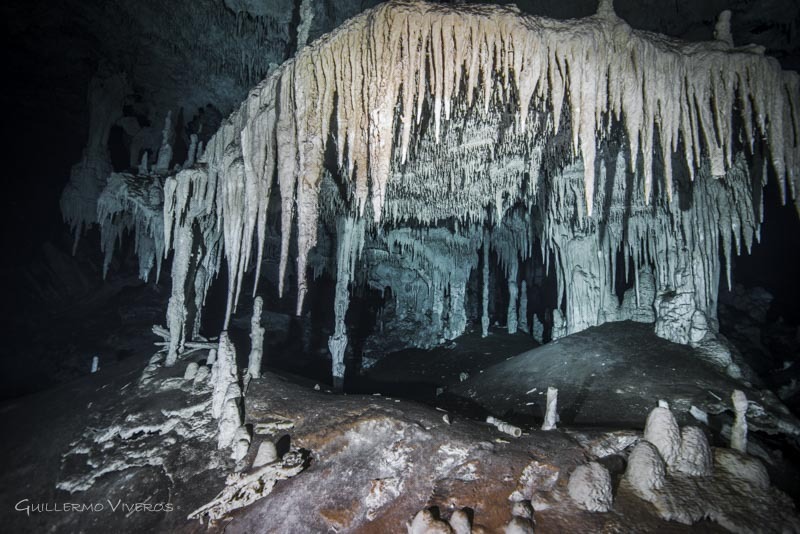 El Zapote cenote, also known as Hell’s Bells. Nikon D-810, Sea & Sea Housing, Nikon AF-S 16-35mm f/4G lens @ 16mm, 2x S&S YS-D1 strobes. 1/100 sec, f/11, ISO 100. Underwater life in cenote cave zones can be quite different from areas where there’s light. 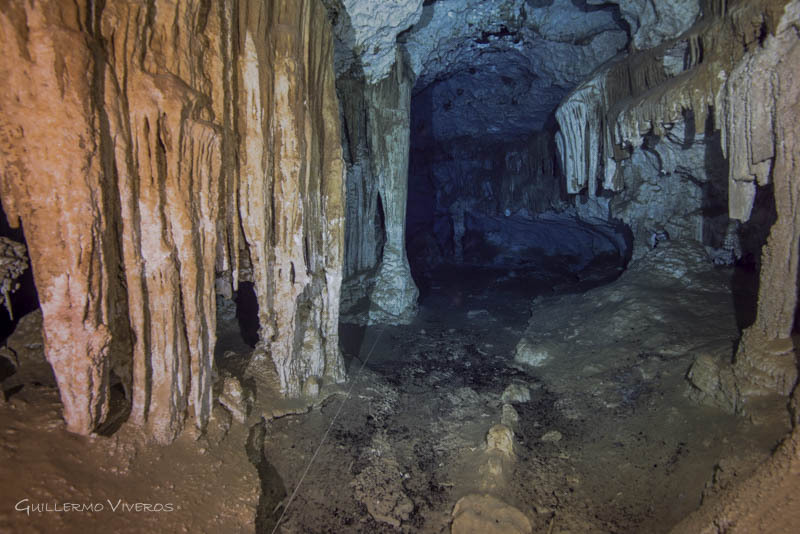 In areas of light you can find small freshwater fish, but how about in the dark cave sections? Amazingly enough, even in the absolute darkness of a cave there’s life. 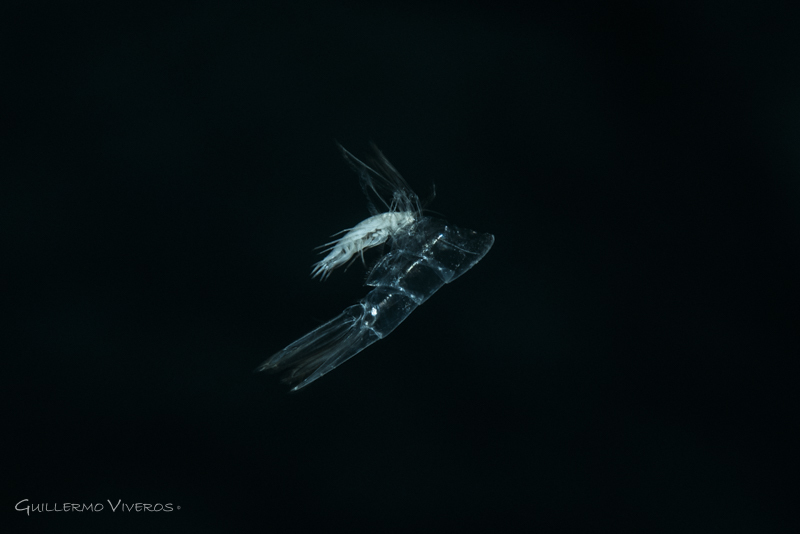 It really makes you wonder how a fish or shrimp or other crustacean can live in such darkness. In some cenotes there’s a fish that is both beautiful and ugly at the same time, called “the White Lady” (Typhliasina pearsei). These very shy fish live in the cave zones of many cenotes. Despite being blind, they are still shy of diving lights because the heat from the lights bothers them. They are not easy to photograph since bubble noise, water disturbance and lights all make them aware of the diver’s presence. Shooting this type of fish requires much patience, low air consumption, and of course a safety-conscious buddy to keep their eye on you and the line as it's easy to get caught up chasing the fish! 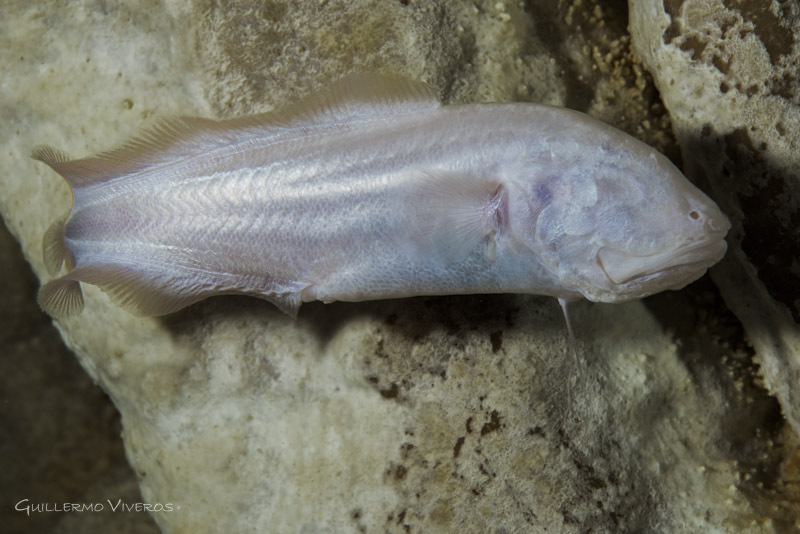 White Lady (Typhliasina pearsei) – a blind cave fish. Nikon D-810, Sea & Sea Housing, AF-S VR Micro-Nikkor 105 f/2.8G, 2x S&S YS-D1 strobes, Sola Photo 800 focus light. 1/200 sec, f/25, ISO 160. Macro photography in a cenote is more challenging than in the ocean. This is due to the complete darkness, and the fact that you must keep your main light covered in order not to disturb the sensitive creatures. I only use a small red focus light, but this makes it even more challenging just to find these elusive subjects. Cave diving in cenotes provides a sensation of loneliness, tranquility, silence, and some doses of adrenaline. Additionally, it is the opportunity to observe how wonderful mother nature is, materialized in beautiful, ancient formations. Diving in a cenote will always give you something to remember. Light reflections where stalactites enter the cenote’s water create magnificent images - at some points producing the illusion of floating or flying objects. Light reflections of stalactites entering the water. Nikon D-810, Sea & Sea Housing, Nikon AF-S 16-35mm f/4G lens @16mm, 2x S&S YS-D1 strobes. 1/125 sec, f/7.1, ISO 125. 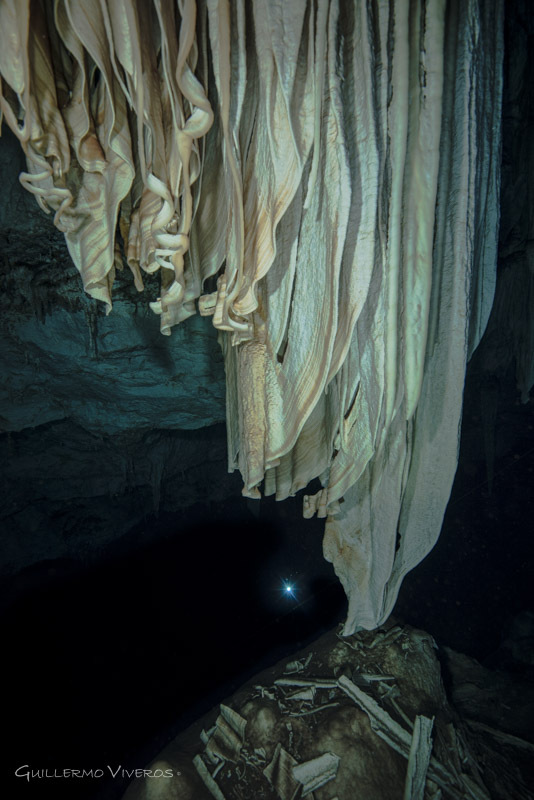 Another marvelous aspect of diving in cenotes is the haloclines. A halocline is the point of separation between salt water and fresh water. It creates the sensation of flying above the water line. Due to differences in density, light reflects differently in each type of water. Diving above a halocline. Nikon D-810, Sea & Sea Housing, Nikon AF-S 16-35mm f/4G lens @17mm, 2x S&S YS-D1 strobes. 1/160 sec, f/7.1, ISO 100. I enjoy every moment and every bit of scenery cenotes have to offer. The more complicated the access and entrance are, the more beautiful scenes you see. In Mexico we have the world’s largest underwater cave system, “Sac-Actun”, which gives me the opportunity to constantly explore this wonderful underwater world. 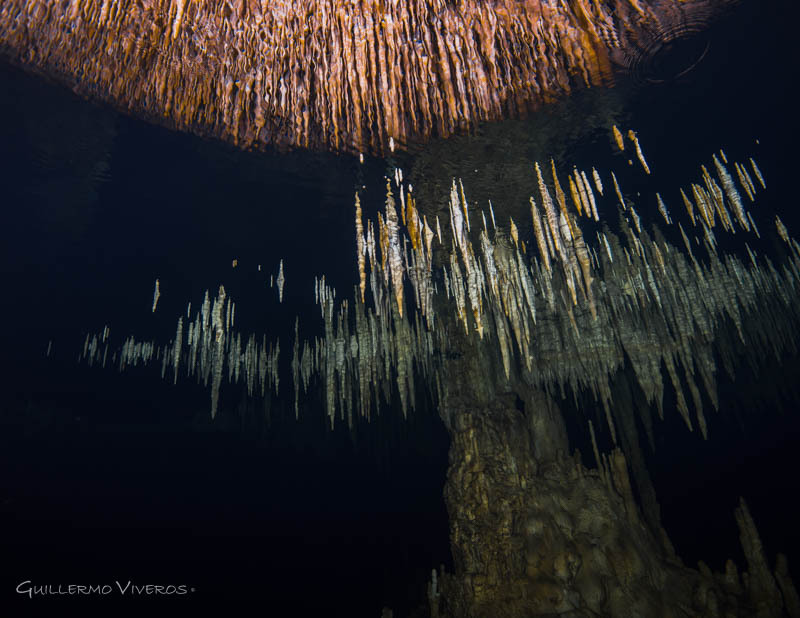 Unfortunately, cenotes do not avoid the impacts of human activity, and water pollution has become an issue in some. The clarity of the water has disappeared near the cities, and garbage is sometimes present in the cavern areas. Large hotels and attraction parks have modified the original landscapes and hurt cenote health. Much of the original fauna has moved to safer and quieter areas. We must care for this fragile underwater system, or many millions of years of geological formations and geological history will be gone for future generations! Bluewater Travel can help you plan and book the perfect cenotes dive trip, including excursions to Cozumel, Isla Mujeres and more. 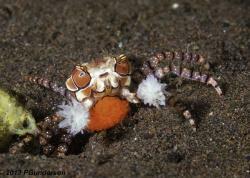 Visit Bluewater's Yucutan Scuba Diving page or email bookings@bluewaterdivetravel.com. Guillermo was born and raised in Mexico City. As an electrical engineer, he’s always been interested in gadgets and photography. He has been diving for 35 years, and during this time he has fallen in love with the ocean and its inhabitants. Through his pictures, he wants to show to others the magnificence of the underwater world, to promote love of the ocean, and to reduce pollution and destruction of ocean habitats. 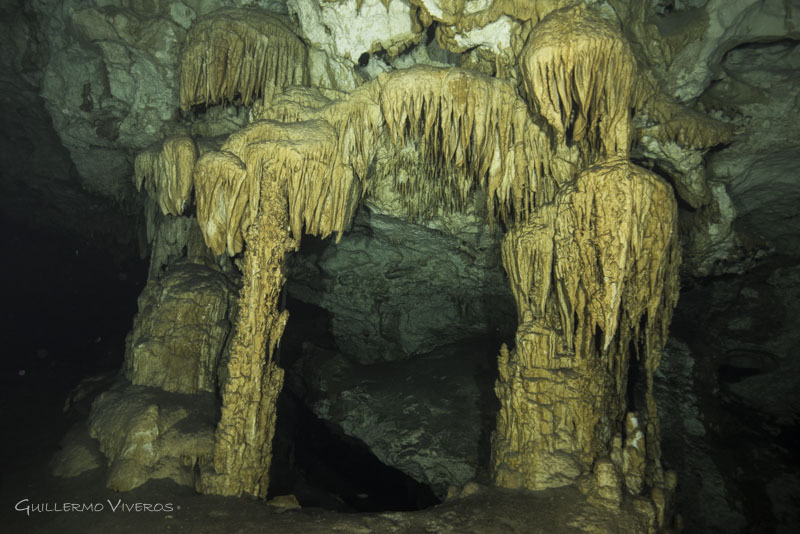 One of his most recent certifications, as a full cave diver, has led him to pursue cave photography, and he is now an enthusiastic photographer in this challenging environment.